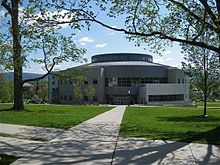 Middlebury College is a private liberal arts college located in Middlebury, Vermont. Founded in 1800, it is one of the oldest liberal arts colleges in the United States. Drawing 2,526 undergraduates from all 50 states and 74 countries, Middlebury offers 44 majors in the arts, humanities, literature, foreign languages, social sciences, and natural sciences. Middlebury follows a 4-1-4 academic calendar, with two four-course semesters and a one-course January term. Middlebury is the first American institution of higher education to have granted a bachelor's degree to an African-American, graduating Alexander Twilight in the class of 1823. 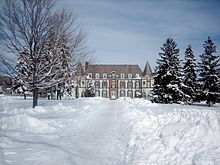 Middlebury was also one of the first formerly all-male liberal arts colleges in New England to become a coeducational institution, following the trustees' decision in 1883 to accept women. Middlebury has an acceptance rate of 16% and was listed as tied for the fourth-best liberal arts college in the U.S. in the 2016 U.S. News & World Report rankings. 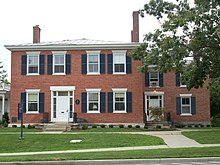 Middlebury received its founding charter on November 1, 1800, as an outgrowth of the Addison County Grammar School, which had been founded three years earlier in 1797. The College's first president-Jeremiah Atwater-began classes a few days later, making Middlebury the first operating college or university in Vermont. One student named Aaron Petty graduated at the first commencement held in August 1802. The College's founding religious affiliation was loosely Congregationalist. 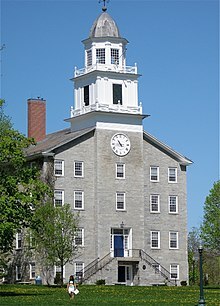 Yet the idea for a college was that of town fathers rather than clergymen, and Middlebury was clearly "the Town's College" rather than the Church's. Chief among its founders were Seth Storrs and Gamaliel Painter, the former credited with the idea for a college and the latter as its greatest early benefactor. In addition to receiving a diploma upon graduation, Middlebury graduates also receive a replica of Gamaliel Painter's cane. Painter bequeathed his original cane to the College and it is carried by the College President at official occasions including first-year convocation and graduation. In 1883, the trustees voted to accept women as students in the college, making Middlebury one of the first formerly all-male liberal arts colleges in New England to become a coeducational institution. The first female graduate-May Belle Chellis-received her degree in 1886. As valedictorian of the class of 1899, Mary Annette Anderson became the first African American woman elected to Phi Beta Kappa. What are the academic rankings for Middlebury College? 1. number 90 for Academics. 2. number 135 for ROI (Return on Investment). What universities are similar to Middlebury College?